Especia’s a group I’ve heard of only by name, but I never knew anything about them. They come from Osaka and were formed June 2012, and have six members. Since the name means ‘spice’ in Spanish, their goal is variety in fashion and in members. While I don’t immediately see it (the group itself seems pretty fashionable in a similar way), it’s a nice idea. What interests me is that their aim is to have 80s/disco themed songs/music. I’ve enjoyed this idol/disco fusion whenever I’ve heard it before (this blog isn’t called Happy Disco for nothing! ), so when I saw this I was intrigued. Right when I started to listen to the title track off their latest EP, Amarga (they have two EPs so far, the second one considerably longer), I immediately heard the 80s influence; synth and saxophone. They immediately go for that 80s feel which is pretty interesting; while that’s not necessarily the part of disco-influenced music I enjoy (this feels a lot more 80s than 70s, that’s for sure), Especia’s music is unique. I can’t think of an idol group that’s ever sounded like them, even when thinking back to older idol artists. So while I’m not quite sure how I like Especia’s music (it’s not doing all that much for me, I’m afraid), I really admire that this group is so unique among all the other idol groups at TIF. In fact, if I was going to TIF I would probably go see Especia at some point, because I bet it would be a refreshing experience. The members also seem pretty talented, which is good because the music is so different that it would be a bit strange to hear lesser vocalists do it. So I definitely recommend you check out Especia; I can’t guarantee you’ll like the music, but this group is really different in a great way. Electric Ribbon’s a pretty unique group as well! There are three members but only two are up front performing; the other member, asCa, is the leader and is in charge of the music/producing. So, from what I can tell, they’re mostly self-run (or run by asCa) which is a pretty interesting and fairly rare group set up. Usually idols tend to be very corporate and run by big companies, but at TIF there are a few groups that are run differently, and that’s always refreshing. The girls also seem older than your average idol, so that’s another way they stand out from the crowd. They have a very electronic/techno sound, presumably based on asCa’s interests/abilities. 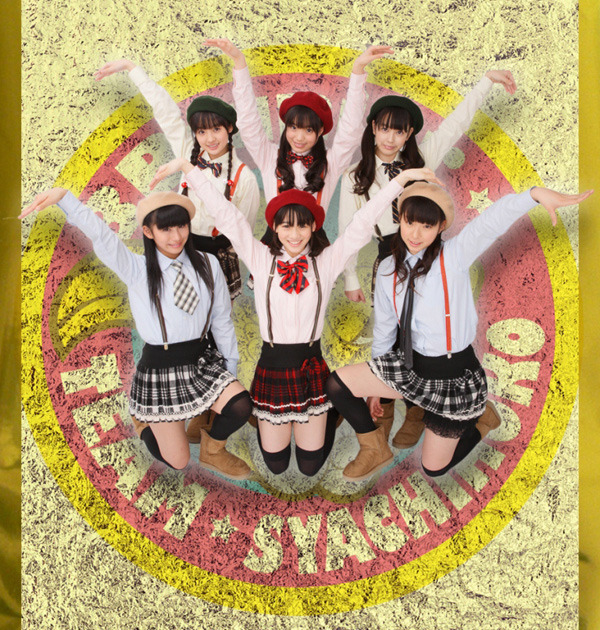 So far there are two singles out; Docchi mo Docchi and Repurikapuriko, and both have been performed as early as 2011, so they have a bit of experience but not a lot of new singles. I definitely prefer Repurikapuriko, but so far I’m not quite into the music. One of the most interesting things is that on the second single fans are encouraged to send in remixes; in fact, there are separate tracks of each instrument in Repurikapuriko so fans can remix their stuff. So if you’re into electronic music and make remixes you should definitely check this out. I can’t say I’m going to follow them too much; it doesn’t feel like they’re a very active group, and so far the music isn’t really grabbing me. I find myself less interested in the idols up front, and with the woman in the back doing the music. So even though I might not become a huge Electric Ribbon fan, like with Especia I can definitely appreciate what they’re bringing to the table. ALLOVER is a bit intimidating to me. I’ve heard of them before, and I know of them, but I’ve never bothered to take much of a look. The reason I’m slightly intimidated is that they’re a super group of indie idols dedicated to spreading Akihabara culture. Members from indie idol groups including asfi, Doki Doki Dream Campus, Nato*Kan, Candy Go Go, Smile*Pocket, Anna*S, and Cover’s Doll have come together to create one giant idol group ALLOVER (Alice Project has also participated in the past, along with a few other groups). It’s really smart, in a way; I had only heard of a couple of these groups before learning about ALLOVER, so it promotes multiple indie idols. Further, ALLOVER is becoming more and more known, from what I’m aware, so it brings up every group. Currently there are 18 full members on three teams with 3 “support members.” The group formed last year, 2012, and have so far released 3 singles. The other great thing about having all these members from different places is, I imagine, it allows for a lot better production values than if these groups were doing something alone. I was immediately impressed when I saw their latest PV. It’s simple, but it’s definitely good looking. I am also impressed by their voices; usually the (unfortunate) bias I have is that an indie idol group isn’t going to have vocal training, but ALLOVER is very listenable. Ultimately, while I was intimidated at first, I’m really glad I found ALLOVER because now I know that they’re actually a pretty group, and one I’m going to keep my eye on for the future! OK, mini history lesson. Back in the day, Hello!Project was pretty much dominating the idol scene (other idols existed, but H!P was definitely pretty big). So, back in 2007, Tsunku created a rival project called Nice Girl Project, primarily by his own label TNX, as a rival to Hello!Project. So he took some Eggs and made The Possible (a group we’ll get to later), and Canary Club became one of the groups. Ogawa Mana was pretty much the star of Canary Club and of Nice Girl Project. Unfortunately, NGP has never really taken off, and eventually Canary Club stopped doing much and fell into obscurity. Their last single was in 2010, Ogawa Mana’s last solo release was in 2010 (a joint single with Berryz Koubou’s Sugaya Risako for the anime Gokujou! Mecha Mote Iinchou!). So it’s really interesting to me that Ogamana is suddenly doing TIF. She hasn’t really released anything lately, as far as I know she’s not doing much of anything. But really, Nice Girl Project, in my opinion, mostly came around at a rough time. 2007-2009 wasn’t exactly the best time for idol acts, before the current idol boom. Ogamana has some good charisma and is a good star; she only came around at the wrong time. So it seems that she has a new Youtube channel (Ogachannelofficial) with some new uploads and new songs. So it seems like she and The Possible are really trying to revive their careers. Which is definitely good for her; she’s cute, has that charisma, and is a really good singer, so I could see her having a good career resurgence with a little promotion and some good songs. I haven’t followed her that closely in the past (though I have a strange fascination with Nice Girl Project, so I check in on them now and again), but I’m really interested to see where she goes now, and I hope that this doesn’t fizzle out like last time. Okite Porsche is from the new wave band Roman Porsche. But beyond that he’s worked with Vanilla Beans, and DJs. Last year DJed at the Idol Club Night, the show for the sexier, adult idol groups. I would honestly be surprised if he did something different this year. More groups have been announced! My work is cut out for me! A group I haven’t heard of yet! These girls come from the “Happy Super Generation,” which, from what I gather, gets girls to become full-fledged idols, and supports/trains them. A lot of focus is on the idea of them becoming “real idols,” and working hard to debut. So these are five girls (one generation) from a project aiming to get girls with no stage experience to become real idols. (One of the things that I always thought defined an idol was that they didn’t really need experience and were new to showbiz, but that’s another blog post). ICT Lovelies released their first mini album “Dare ga Debut Dekiru no?” (Who can Debut?) last November and have since released another mini album. So even though there’s not too much about this group out yet, they have a surprising amount of original music out there. Most of what I found is rehearsal videos, and I haven’t seen a PV yet. They seem to have a more rock-themed sound and are actually pretty good performers so far. The whole “we want to debut!” theme is a bit stale at this point, and there are plenty of groups doing that whole thing. Still, for all their emphasis on the group being new and fresh, they’re actually pretty strong already as a group, and I find myself interested in them, despite my skepticism at their concept and and at Happy Super Generation as a whole. I have no idea if they’ll go anywhere from this, but I like them already, so I’d recommend checking them out. Afilia Saga is one of the many groups that I feel like I should follow more but I don’t. And it’s a shame, because they’re definitely a solid group that’s worth paying attention to. Afilia Saga, formerly Afilia Saga East, is formed of maids at the Afilia Saga maid cafe chain. The chain itself is set in an imaginary Afilia Kingdom, with a role-playing, magic concept to it as well. Needless to say, the ins and outs of the maid cafe chain are a bit irrelevant to fans outside of Japan (though I know I’d be all over this if I was in Japan), but it does explain why members have unique stage names, like Louise Sforzur and Laura Sucreine. It’s all a part of the maid cafe. So far the group has released multiple singles and two albums (the most recent release was their album Archism, that came out in April of this year). If you aren’t familiar with idol groups other than the main mainstream ones, Tsunku (of Hello!Project fame) wrote their song “Knee-high Egoist.” He’s also producing the Akihabara Backstage Pass cafe and their idol group with the Afilia Saga producer Chiyomaru, and Afilia Saga is considered to be a part of that massive group. Like I said earlier, this is a group I wish I’d follow. I like the concept (though I wish I’d see more of the whole fantasy world in their PVs, from what I’ve seen at least), and most of the songs/PVs I’ve heard are quite good. This is a well-produced group with really good production values, so if you want a group that’s not quite as indie as the rest of Tokyo Idol Festival, Afilia Saga might be a good group for you. This is a hard band to look up. Victory is not a very good idol group name if you want people to be able to easily look you up. That said, I’m not finding anything on them, and if you know anything please tell me. There’s no webpage linked, and all I can find is this picture on the TIF site. They’re holding guitars so I guess they’re more of a band? Perhaps they’re a self-composed idol group, like Kurikamaki, and just picked a name that’s really tricky. Otherwise I’m stumped. Sorry guys. EDIT: This morning I was alerted that Victory created their official site. They were a band of five girls created when they were in their last year of Elementary school. Now they’re a high school age band, and have participated in Teens Rock Festibal in HITACHINAKA as well as Rock in Japan 2011. So as opposed to be more idol focused, it feels like they’re going the route of SCANDAL and other bands. They have some videos on their website, and I have to say that even though I wouldn’t classify them as idols, they kind of fit into my alternative/indie rock genre that I like to listen to when I’m not listening to JPop. These girls are clearly talented (the vocalist is wonderful and there’s some great instrument playing in Home) and I can see myself becoming a fan. So if you’re open to rock and bands as opposed to strictly idols, take a listen. This is the group behind one of my favorite idol groups, Rhymeberry. While Rhymeberry was a subgroup, they’ve become their own separate act so I’ll cover them as such. The group currently has 11 members that perform regularly at the Akasaka Genki theater. The average age of the members is a very young 13 years old, because they (like Sakura Gakuin) graduate the girls once they hit high school age. Personally it’s not my favorite tactic, and I think it’s one that ultimately hurts groups (especially since they have to graduate some of the popular members), but if you like really young idol singers then Usa Usa Shoujo Club is one to check out. They’ve had multiple subgroups in their time; Chu Ni, Zipcode, and now Little Rabbits. Rhymeberry, the rap subgroup, has been the most successful. However, in the past year Usa Usa Shoujo Club has released their debut single “Number One” which sold 1000 copies (which tells you what level of popularity they’re currently at). Personally, while I like the group, it’s a bit hard to follow all the new members and graduations, especially since the main focus is on performing. The group is pretty good, though, and they’re very cute, so if you can get past that mandatory graduations thing then I definitely would recommend them to you. Also, go read my friend Magic Thomas Jefferson’s write up of going to an Usa Usa Shoujo Club event HERE. He talks a bit about going to one of their live events, and helped me out getting my initial information about the group last year (which got me into Rhymeberry). This is one of the first acts of the year that I’ve never heard of before, and wow it’s kind of an interesting one. This act actually comes from Stardust Promotions of Momoiro Clover Z, Shiritsu Ebisu Chuugaku and Team Syachihoko fame. Only, this has been around before MomoClo’s big major debut in 2010. This was originally a group of “big sister” idols known as S Spicy, but became a solo project of Kurita Moe, S Spicy 1. They released one single “Exotic Spice” in 2010 but haven’t done much of anything since. This feels like they’re doing what Nice Girl Project has done, by trying to bring back projects from old (See: The Possible, Ogawa Mana). The only songs from this group/solo act, Exotic Spice and Crying Face, are on the official website and definitely aren’t bad at all. So it’ll be interesting if they actually try promoting this, considering how well Stardust has been doing lately. Hey everyone! I know I’ve been MIA for a while, but that was just me working hard finishing my degree. Haven’t gotten my diploma yet, but I’m graduating with a degree in Studies in Cinema and Media Culture with a minor in Asian Languages and Literatures. My minor being almost entirely fueled by my idol interests (since that’s what made me decide to take Japanese in the first place). But don’t think that since I was busy that I’ve forgotten about idols, specifically Tokyo Idol Festival! While seven of the bigger acts were announced earlier, recently 46 new acts were announced! While there are some notable groups that aren’t listed, last year there were groups announced within weeks of the show. So if you check the official list and don’t see your favorite act, don’t worry just yet. In the past year nothing huge has happened with Idoling. They’ve released two singles (the most recent being Sakura Thank You), and a member (Nomoto Manami) left. One member (Yokoyama Rurika) is making a solo debut. Otherwise, it feels like they are a pretty steady group, without much drama, which is either good or bad depending on what interests you in an idol group. Personally, Idoling!!! is a group that I fully recommend but that I don’t really follow too much. Especially after my favorite member (Yazawa Erika) left I don’t really have much drive to follow them. However, they are fairly equal in screentime for most of the girls, they have a lot of variety, and I really love a few of their songs (especially Me ni wa Aoba Yama Hototogisu Hatsukoi and Don’t Think Feel). They’re consistent and good, and definitely worth looking into if you haven’t. Another group I covered last year! As I mentioned then, they were originally B.L.T (the magazine not the sandwich) Idol College, formed in 2009. However, on March 31, 2010 B.L.T. Idol College was disbanded and Idol College was born the next day with all new members. It seems like they’ve done quite a bit since last year; last year they had released one album and one single. However, they’ve recently made their major debut with the double A-sides Shoujo Sotsugyou and YOZORA, and since they sold more than 10,000 copies in a month they get to go on tour. So it seems like they’ve made major strides from last year’s TIF. Their (somewhat unoriginal) theme is growth and becoming better idols, hence the “college” in their name. Still, this kind of fits seeing just how much they’ve really grown since last year, when they were doing very basic PVs and had a much smaller audience. I don’t know if I’d say they’re a force to be reckoned with, but they’re definitely a group to keep an eye out for because of how much they’ve grown over the past year. At this point I feel like the “Temporary” after the name is only there so they can use it as their logo, because really this group has gone a long way so far. Formed from seven former Hello!Project Egg members, this group is still under the Up Front label but isn’t within Hello!Project. They also go as UFZS to do KPop dance covers, but Up Up Girls (Kakko Kari) is their main pop group name. Up Up Girls are BUSY. 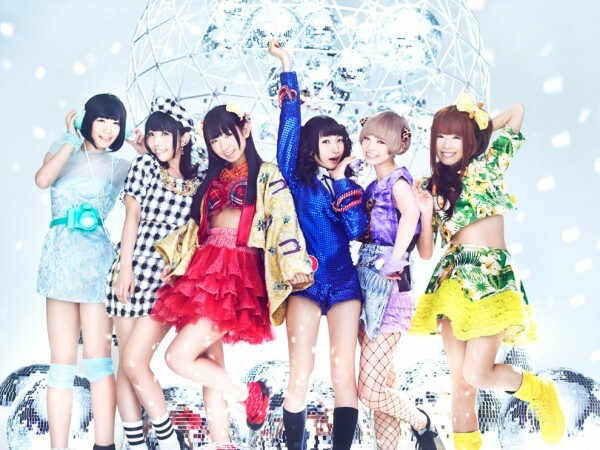 They perform on a very regular basis, and since last year’s TIF have released eight singles as well as an album, In fact, so far they’ve put out three singles in 2013 and are releasing another one in June. This will put them at twelve indies singles and an album. They’re also very active online, streaming a lot of live things and putting things on their youtube. They do a lot of dance covers as well as six separate Harlem Shake videos. Yes, Up Up Girls are into internet memes. While I don’t follow them quite as much as I should, I personally really like Up Up Girls. The members are fantastic and they generally do a lot of quality work. I kind of wish they’d move into a major debut so they could get PVs and things, but there’s something nice about them doing a lot of indies work and putting out a LOT of stuff. One of the biggest issues with a lot of the TIF groups is that some of them barely put out anything and they don’t do a lot of new things. This isn’t the case with Up Up Girls at all. If anything, my only issue is that Up Up Girls really feel like a group you have to see live to really get the full experience (though this is the case with most idols). But they’re definitely recommended. Yet another group I’ve covered (this is kind of a trend). AeLL is one of the big seven acts that were announced first, though I honestly didn’t know they were that big and they’ve only released one single since last year ( Magic⇔Music). Formed in 2011, this group centers around Shinozaki Ai, a fairly prominent gravure idol. The group name stands for “Activity Eco Life with Love,” which I noted last year as being kind of a permanent Ecomoni; however, aside from their first single “Ecology Monkeys” I’m not sure how much this has been a theme for them. They performed at the hot stage last year, so it’s interesting to see them do my favorite song by them (Chu Chu Hareru Yeah) at TIF, if you haven’t seen much of the actual stages from the show. Like I said they’ve released one single and so far that’s probably my favorite song by them. Last year I noted that AeLL’s music tended to be kind of mid-tempo plain idol songs that didn’t interest me, but this adds an electronic element that fits them. All the members seem more glamorous than cute, which is a bit of a unique aesthetic. Personally, I don’t find the group to stand out that much. If you like the aesthetic of the group you might want to check them out, as well as if you like their songs. However, this is one group I’m almost constantly at a loss to describe because I don’t find them all that compelling to follow. If this group doesn’t perform ‘It’s Raining Men’ I swear it’s a lost opportunity and a shame. This is a pretty unique group in that it’s seven Taiwanese girls who acted as weather reporters on TV and on the internet. Seven were chosen to become idols and thus Weather Girls, focusing on being idols in Japan. Each girl represents both a day of the week, a color and a type of weather, and they have also been taking Japanese lessons to be better idols in Japan. They officially made their idol group debut in August of 2012, so they’re pretty new. So far they’ve released two singles, but they’re releasing another in June (Koi no Love Sunshine). All of their single titles fit with this weather gimmick that I wonder how long they can keep up with. After watching some of their weather reports, they’re certainly something; it’s less reporting as being entertaining while you watch the weather. Certainly more interesting than normal weather reporting! They are really committed to this weather gimmick, and their PVs are really well made. If any of this interests you I’d definitely recommend you check out some of their PVs or their weather reports. They’re definitely not a boring group, and I’d imagine seeing them learn Japanese would be pretty interesting. As a group they definitely have a KPop/SNSD aesthetic, which is cool but not really my thing. Nothing has really made me that interested in following them for the long term, but they’re definitely really interesting to check out!